1. So if I had told you, I mmediately after playoff loss to the Broncos, that the Steelers would open on Monday Night on the road vs. a defending divisional champion, and absent Health Miller, Le’Veon Bell, Martavis Bryant, the marquee free agent the Steelers signed to replace Heath, Steve McLendon, Markus Wheaton, Will Allen and everyone on their cornerback depth chart not named Gay or Cockrell, what would you have said? 2. Speaking of the post-Heath Miller era, while we don’t have a very strong sample, what is your rapid reaction to the Steelers “Tight end by committee” approach and do you think this can be sustainable long term if need be? 3. After the game Cam Hewyard lamented the lack of pressure on Kirk Cousins. If ESPN’s statistics are correct, the Steelers only touched him twice, and did not sack him at all. Is this enough to trigger your internal worry wart? 4. A big part of the Pittsburgh Steelers mystique comes from the fact that they’re a no frills organization. Decal on one side of the helmet, stood in the shady side of Three Rivers for years, no cheerleaders, etc…. So what do you think of the fact that they’re using “Color Rush” uniforms which are all the rage? 5. This week of course brings up the rematch against the Bengals. Clearly at this point, the Bengals are the Steelers’ hottest divisional rivals. But going beyond the here and now, where do you assess the cumulative impact of the Bengals rivalry with the Steelers relative to the others? 2. I’m comfortable with James as a receiver at this point, though there is likely to be a drop off in blocking. I am completely comfortable with David Johnson as a blocker, and he is a better receiver than anyone gives credit. It would be better to have Green than not, but if not the situation at tight end will be adequate. 3. The best news is that Cam is upset and not settling or making excuses. That being said, everything from the scheme to Cam’s diminished health played into this result. To my eyes Pittsburgh had decided to let Kirk Cousins beat them if he could. On his feet or on his back didn’t matter in the end. 4. Do they really have a choice in the matter? Color rush appears to me to be league policy, and ultimate purpose seems clear; open up another profitable line of apparel sales. The Steelers jerseys are already being offered for sale. 5. There are two tiers of Steelers rivals. Those who compete with them, not only on the immediate field of play, but at the level of pursuing the ultimate prize, Lombardis. Baltimore qualifies. The second group are more or less confined to having a series of hateful encounters, but that’s the end of it. Right now the Bengals are just Cleveland with more talent. Until they can actually win a championship it will always be a little less than the Ravens. #4. You are correct. Revenue generating move mandated by the league. That being said, I like the Steelers version. If they sold one for #91, I would seriously consider buying it. 3) I would have like to see a bit more pressure but considering the apparent game plan, I don’t have a lot of concern. I think we will see more pressure applied against the Bengals. 4) I didn’t think they had a choice when it came to Color Rush uniforms. The colour scheme they settled on is fairly conservative. 5) Until the Bengals win a playoff game, it will be hard to take them too seriously. So far their main contribution is a return to 1970s level thuggery, which has basically been banned from the league. I am more concerned that Burflict will kill or permanently cripple someone on the field. I hope all is well with Hombre. Although I am certain the rest of the team is more than capable of putting together a set of interesting questions, I don’t know if it will have quite the same flair. 1. I would get a bit nervous about another season opening loss until i found out it was against the Washington DC Team (callout to mama), and then started laughing at the fact they were division champions. 2. All TE’s seemed to hold their own in run/pass protection. I don’t remember much of the TE’s other than that and the almost TD Jesse James had except for an excellent pass defense by the Washington CB. 3. Not yet. It is still only the first game of the season. Also, if i remember correctly, Gruden was commenting that we were not throwing all that many blitzes at the skins so the lack of pressure is somewhat understandable. 4. The color rush uniforms seem understated compared to what they could be. And their “color rush” is Black. Still the black and gold and not nearly as loud as the throwback bumble bees, which i like. 5. Right this moment, Cinci is a huge rivalry for the fans based on the recent games. The Ravens are still the biggest rivals. Cinci has a ways to go in close games before they could overtake the ravens. They have surpassed Cleveland though since they have been so bad for so long I can only feel sorry for them, though still happy to see us annihilate them. 2. Well, obviously if it has to be long term, it will have to work, and I trust Haley et al to find a way to make it work. That said, I was impressed by Jesse James, Outlaw Tight End. I thought he looked more than competent. And I’ve long felt David Johnson doesn’t get sufficient credit. 3. No. Despite Cam’s heartache I don’t think the plan involved taking Cousins down a lot (although of course it would have been a nice bonus.) I think the plan was not to leave the secondary out to dry, at least until such time as the coaching staff feels more certain about their abilities in coverage. And it is interesting to note that Cousins made a lot of off-target throws. It’s entirely possible it was because of the pressure. 4. I’m not sure they are being given the choice. 5. I feel as if the animosity which has characterized Steelers-Ravens had a lot of its genesis in Ray Lewis et al. I think it has transferred to another linebacker, namely Vontaze Burfict. Assuming the Ravens are back to their winning ways (I originally wrote “sinning ways,” which was perhaps Freudian) I’m guessing the intensity will ratchet up nicely. 1 – I’d say “well, glad there are 16 games in the season”. 2 – It’s doable for now since there are so many other good receiving options. I do think the blocking aspect will remain the most important part of that position. 3 – No, because it seemed plan. Steelers only rushed 3 many times. I guess Cam might kick himself for not beating a constant double team, but I’m not worried. 4 – Do they have an option? As long as the team is recognizable, I don’t care. It’s the play that matters to me. 5 – I think it will fade sooner than later. The Bengals and their fans, as they stand now, are difficult to take seriously because they genuinely believe that there are league conspiracies against them. This rivalry can’t ever top the Ravens rivalry because that one was built on respect between opponents. 1. Momma would be angry at my language. 2. Yes. Assuming Wheaton, Eli and Sammy are productive, James and Johnson are good enough to block a catch a few passes. This is a high octane offense. I think Randy Grossman could come back and do enough. 3. Not really. There were a lot of 3 man rushes, as the strategy was to provide max coverage and force Cousins to read the zones and be extremely accurate. While he was accurate, they were totally unable to break a big one. Stay tuned. 4. Don’t really care. Wearing a different uniform on Christmas will not change who we are or what we are. 5. The rivalry has really replaced the Browns rivalry. That’s kind of sad, but the hapless Browns are a chronic mess. The Cinci rivalry does threaten to supersede the Ravens rivalry. I never thought I’d say that, but I never thought I’d detest a player more than Ray Lewis until Burfict came along. 2. I think the Steelers “Tight end by committee” approach will be adequate for passing but not for blocking. That’s what worries me: blocking to keep Ben upright. 3. Nope. My internal worry wart is still humming happily, oblivious to the lack of sack this past Monday. But only because the pressure or the threat of pressure was game-planned by dropping 7-8 defenders into coverage for most of the game. The 3–4 defenders rushing the quarterback was enough to make was enough to make Cousins nervous and affect his play, which can be expected from the less experienced QBs. If they want the same effect – nervous to the point of affecting his throws – on Dalton this week, I think they’ll have to actually have to pop him once or twice early in the game. 4. The solid black uniforms with gold numbers are sublime and appeal to my minimalist aesthetic. Looking badass helps too. 5. The Bengals feel they are rivals with the Steelers because the Steelers are the team to beat in the division, every year. The Ravens feel they are rivals with the Steelers because the Steelers are the team to beat in the division, every year. Where is the talk of the Bengals-Ravens rivalry? It isn’t there because the Steelers are the team to beat in the division, every year. I see a pattern here. Whether it’s raven bugs or bangles bugs that are splattered most on the Steelers windshield, it doesn’t matter. The Steelers wipers will scrape them off. Completely unrelated but I wanted to post before I forgot. FiveThirtyEight had an article discussing how lame the rivalry was between the Bills and the Jets. They consider it the 4th worst in modern era. The worst you ask? Bengals vs Browns. When I want to know what to think about sports stuff, I go to Nate Silver. He’s my thought leader. And when I want to know how I should vote in an upcoming election, I wait to see who the glamorous Hollywood stars and musical celebrities are supporting. You can’t go wrong that way! Thank you, Homer, for sharing your plan. It’s amazing, and so easy! Some days you are sublime but you are always good. 2) So long as we don’t get Ben killed, we’ll be okay. So it’s pass pro and run blocking that matter to me. The Outlaw’s blocking has been inconsistent, but his receiving abilities have a ceiling as tall as he is. So we have to live with the committee and hope that he will be like Spaeth. Spaeth was another tall drink of water who started out shaky as a blocker, but turned into a very good one. 3) They did fine. Glad they’re still hungry, though. 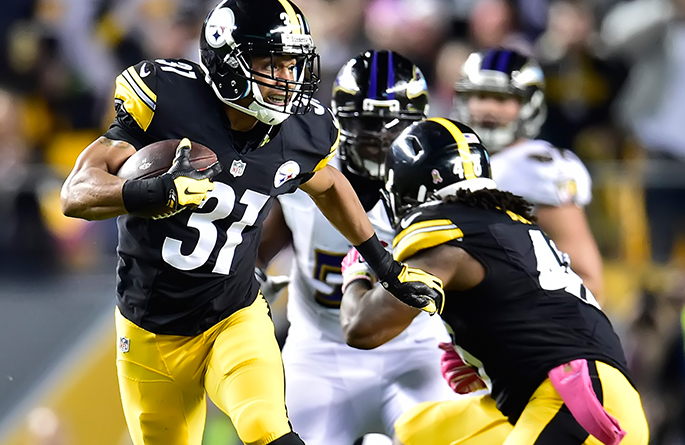 The ‘skins weren’t ready for the Steelers’ playing eight men back, and had game planned for zone blitzes. It was the first game of the season, and Cousins and his coaches didn’t have an adjustment ready. So Cousins kept his uniform clean, but he led them to only one TD. 5) Baltimore and Pittsburgh is a rivalry. It seems like they went 15 years, twice a year – or three times sometimes – and every single game was decided by three points or less. It wasn’t that many years, but it was pretty close. Two great heavyweights, like Ali and Frazier, who were evenly matched and gave their all. And they – and their fan bases – respected each other. With Cincy, it’s cheap shots and hatred. Cincy is the criminal element of the league that Chuck Noll referenced, back when he was talking about the Oakland Raiders of the mid-70’s. The Ravens are the rivalry, and worthy adversaries. The Bengals are like a bad case of hemorrhoids. Annoying as hell, but, so long as you take care of the damn things, they’ll go away sooner or later. It will be on the H-back not preparing properly. 1. Frankly, I wouldn’t have sweat much of that other than Bryant and Wheaton being out. I could have never foreseen Eli Rogers. Everybody else I could see the players I would have felt comfortable could step in, like McCullers and The Outlaw. 2. Jesse James as a receiver is probably as good if not better than Heath in his last year or two, although the relationship Heath built with Ben has to be taken into account. Still I feel good about Jesse being able to get further downfield for some catches, and Heath didn’t have quite the same hands by the end. He isn’t the blocker that Heath was even at the end, but David Johnson is. Interestingly I read somewhere just this week, can’t remember where, that he was been more and more impressive in practice. I saw him make a few blocks last week that looked solid. 3. Not sweating this either. I’d like to see them get a couple this week with a few more qb hits, though. Particularly by only rushing four. Come on Jarvis, shut some people up for a week. 4. I’m not a guy who buys player jerseys. Not my thing. But the Steelers black color rush uniforms are making me consider buying my first and undoubtedly only. 5. Bengals are mini rivals. It’s good right now, but to really be a rival they need to sustain their success. And I mean all the way through Andy Dalton’s career.